Desalinization plant at Puerto Penasco to supply Arizona? 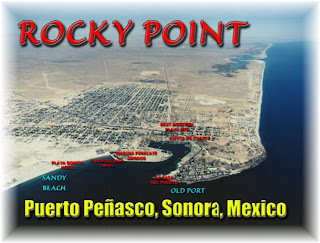 The non-profit Arizona-Mexico Commission, a trade and business group is proposing a study on the feasibility of a jointly operated U.S.-Mexico desalination plant at Puerto Penasco ("Rocky Point") on the Gulf of California. According to a story in today's Arizona Republic, the "study will look at a range of issues, including cost, funding sources, energy needs and environmental effects on the gulf. Its findings could point toward a joint project with Mexico or to some other alternative. The major players so far are Puerto Peñasco; the states of Arizona and Sonora; and Arizona's two largest water providers: Central Arizona Project and Salt River Project." The proposed study would examine the challenges of building a plant to handle 11.4 million gallons a day at the start and up to 45.6 million gallons a day by 2020, enough water to serve at least 250,000 people a year. A desal plant planned near Huntington Beach, Calif., that could produce up to 50 million gallons of drinking water a day will cost an estimated $250 million to build. There are no explanations of who would pay for the Puerto Penasco plant. I've been an earlier and strong endorser of Science Debate 2008, the movement to get the presidential candidates to debate science issues or to at least answer a set of the 14 top science questions. Sen. Obama is the first to answer the 14 questions. Sen. McCain's answers may be forthcoming. The 14 questions were developed from over 3,400 questions submitted by more than 38,000 signers of the ScienceDebate2008 initiative. The questionnaire is a joint effort led by ScienceDebate2008, with Scientists and Engineers for America, AAAS, the National Academies, the Council on Competitiveness, and several other organizations, together representing over 125 million voters. Questions cover energy policy, water, climate change, education, innovation, scientific integrity, national security, economics in a science-driven global economy, health care, ocean health, biosecurity, space, stem cells, genetics, and research. Federal prosecutors today issued a corporate disclosure statement naming Resolution Copper Mining LLC of Superior, and two other companies as "for-profit corporate victims of criminal activity" alleged in the indictment against Congressman Rick Renzi and his business associates earlier this year. At the same time, prosecutors delivered copies of the evidence against Renzi to his lawyers. Among other things, the indictment accuses the congressman of crafting a swap of federally owned mining land that would benefit himself and a business partner. Today's action by prosecutors supports news reports that Resolution Copper refused to go along with the alleged deal. 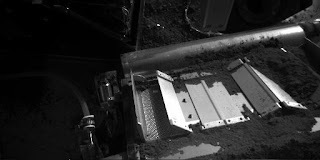 With the completion of the initial 90-day mission, the Phoenix Mars Lander team noted a number of successes: Phoenix has already confirmed the presence of water ice, determined the soil is alkaline and identified magnesium, sodium, potassium, chloride and perchlorate in the soil. The Stereo Imager, Robotic Arm Camera and microscope have returned more than 20,000 pictures since landing day, May 25. The selection of Sarah Palin as the Republican vice president candidate is suddenly making hot political issues out of mining, oil and gas, and teaching evolution. Emails and blogs started pouring out almost as soon as the announcement was made. For example, mining columnist Jack Caldwell, who blogs at "I Think Mining" is being widely quoted for his post that "This is about to become the most exciting election ever. And mining issues may well be central." The energy industry is abuzz this week because Gov. Palin just a few days ago signed a bill authorizing the state to award a license to Calgary-based TransCanada Corp. to build a $27 billion, 1,715- mile (2,744-kilometer) pipeline to carry 4.5 billion cubic feet of natural gas per day from Prudhoe Bay to the Alberta Hub in Canada and then on to U.S. markets. Under its license agreement with the state, TransCanada will get a $500 million subsidy in return for seeking federal regulatory approval for the project and finding customers for the pipeline. The license doesn't guarantee construction of the project. Competitors for the license were ExxonMobil, ConocoPhillips, and BP. Gov. 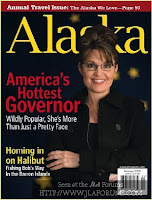 Palin is chair this year of the Interstate Oil & Gas Compact Commission (IOGCC). Arizona is a member and AZGS is the state contact with IOGCC because we provide support to Arizona's oil and gas commission. A couple hours after the VP announcement, I got an extensive bio of Gov. Palin from IOGCC along with a video clip of her speech to IOGCC this spring. A few minutes later, a colleague from the evolution battles in Kansas forwarded a clip from the Anchorage Daily News during the 2006 gubernatorial campaign which reported, "The volatile issue of teaching creation science in public schools popped up in the Alaska governor's race this week when Republican Sarah Palin said she thinks creationism should be taught alongside evolution in the state's public classrooms." This is now flying around the blogosphere in the science and science education communities. The U.S. General Accounting Office this week publicly released a report it gave to Congress last month on "Hardrock Mining: Information on State Royalties and Trends in Mineral Imports and Exports." 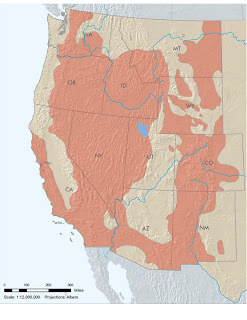 The report responds to Congress’s request for information on revisions to the 1872 Mining Law by evaluating royalty policies for hard rock mining within 12 Western states, tracing the importation statistics of 15 hardrock minerals since 1975, and assessing the difficulty of aggregating information on the collection and maintenance of mining data, according to a summary in the AGI Government Affairs bulletin. Flagstaff-based geologist, doctor, and professional photographer Michael Collier will exhibit Stones from the Sky at the Houston Museum of Natural Science starting September 13, 2008, according to an announcement from AGI. Michael specializes in aerial landscape photography, taking dramatic shots of areas such as the Grand Canyon, Death Valley, Canadian Rockies, and Alaskan Glaciers. His current exhibit consists of 45 prints that highlight the American geologic landscape. He currently spends about half his time in the field, or the air, taking photos. The other half is spent as a family doctor in Arizona. There was a report this afternoon that the popular "Science Friday" show [right, host Ira Flatow] on public radio, will broadcast from the Phoenix Mars Lander command center at the University of Arizona on Friday, Sept. 19. I 'll share details when I find out more. Mining.com says "The $1,9-billion Tenke Fungurume mine will initially produce an average of 250-million pounds of copper and 18-million pounds of cobalt a year, but Freeport has high hopes for significant expansions and even additional projects at Tenke Fungurume. The current mine plan is based on ore reserves of about 100-million metric tons, with average ore grades of 2,3% copper and 0,3% cobalt, but the company believes there is the potential to triple the reserves at Tenke in the medium term, Freeport CEO Richard Adkerson said last month." Freeport calls Tenke Fungurume " the largest undeveloped, high-grade copper/cobalt project in the world today. " Grupo Mexico's Phoenix-based subsidiary, Americas Mining Corp., put $2.7 billion in cash plus a $440 million guaranteed bond on the table today in a bold proposal to win the court battle over who controls Tucson-based Asarco. Grupo Mexico expects to use another $1 billion of Asarco's cash to offer "full payment of all of allowed creditor claims." The way I understand it, the difference in the two reorganization plans in front of the bankruptcy court is that Asarco LLC proposes to settle claims of billions of dollars in environmental and asbestos liabilities, while Grupo Mexico would continue to litigate them. Under today's proposal, Grupo would pay them in full, once the courts determine what is owed. Grupo argues its plan is better for Asarco creditors "since it remains the only proposal offering creditors full value for their allowed claims." The key word there seems to be "allowed" - the amount allowed by the courts, rather than amounts negotiated between creditors and Asarco in the competing proposal. The judge is expected to make a decision as early as next month. 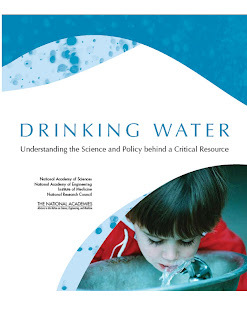 The National Academy of Science has published a new, 28-page report on "Drinking Water: Understanding the Science and Policy behind a Critical Resource." It can be downloaded at no cost. 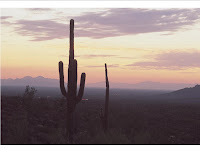 Tucson is featured for our water-conservation measures and Phoenix is discussed for it's rapid population growth and demands for water as symbolic of much of the West. 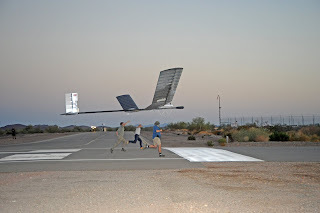 The Zephyr, a solar powered plane, flew for 82 hours 37 minutes, exceeding the current official world record for unmanned flight which stands at 30 hours 24 minutes set by Global Hawk in 2001 and Zephyr's previous longest flight of 54 hours achieved last year. The 3.5 day flight took place at Yuma Proving Grounds last month but was just announced. Keeping a solar powered plane in the air for 3 nights is no small feat. Although touted as eventually being used for research purposes such as earth observation, the initial and primary uses will be military. The plane is jointly funded by the UK Ministry of Defence in partnership with the US Department of Defense (DoD). The plane's builder, British defense contractor Qinetiq said, "Launched by hand, Zephyr is an ultra-lightweight carbon-fibre aircraft. By day it flies on solar power generated by amorphous silicon solar arrays no thicker than sheets of paper that cover the aircraft's wings. By night it is powered by rechargeable lithium-sulphur batteries, supplied by SION Power Inc, which are recharged during the day using solar power." The flight trial at Yuma took place between July 28 and 31 with temperatures up to 113°F. Zephyr was flown on autopilot and via satellite communications to a maximum altitude of more than 60,000ft. ADWR has released Volume 8 of the 9- volume Arizona Water Atlas, "Active Management Area (AMA) Planning Area." 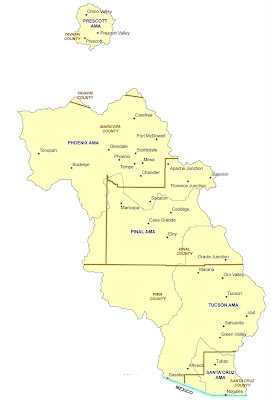 The volume covers the 5 AMAs that contain about 80% of the state's population, Prescott, Phoenix, Pinal, Tucson, and Santa Cruz. The downloadable file is 236 Mb, but a lower quality, compressed version at 18 Mb is available or you can download one section at a time. The editorial in yesterday's Denver Post declared, "The West will not be ignored" and predicted that the 8 Rocky Mountain states are no longer predictably Republican and perhaps four or more could go Democratic in the presidential contest. "Like all Americans, Westerners grumble at the rising cost of gasoline and home heating. But we also host the nation's greatest storehouse of natural resources and worry about how the rush to drill for gas and oil, mine uranium and eventually perhaps produce oil shale can affect our fragile environment and precious water resources. And we can't wait for both parties to address those issues." Gov. Napolitano noted that just 6 years ago, all 8 states had Democratic governors. Today, 5 of them, Arizona, New Mexico, Montana, Wyoming and Colorado, have Democratic governors. I think the Post is on target. 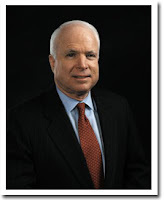 Sen. McCain recently weighed in on the Colorado River Compact and today's Las Vegas Review Journal discusses both McCain's and Obama's positions on nuclear waste storage at Yucca Mountain. The Havasupai tribe is closing the village of Supai to visitors until damage from the August 17 flood is repaired, expected to take until next spring. There are reports of extensive destruction of the travertine deposits that make up the face of the waterfalls and form the pools at their base. There was also extensive damage to bridges, campgrounds, and trails. 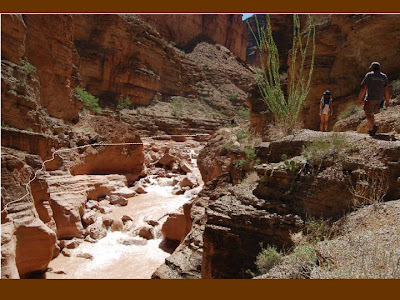 Tyler at the "I'm Just Sayin.." blog has posted an extensive first-person narrative of the Havasupai flood of August 17, with numerous photos (one of them at right) and videos. The videos of the creek and waterfalls add greatly to what's already been posted elsewhere and there are a lot of photos of the flood, refugees, and the rescue. Tyler's tells an amazing story of rescues, heroism, confusion, and frustration through the ordeal. Rio Tinto Ltd. profits were up 113% to $6.91 billion, for the first six months of the year over last year, compared to $3.25 million for the same period a year earlier. Revenue also more than doubled to $27.19 billion from $12.06 billion. The company attributed much of the rise to increased prices for iron ore and aluminum. Fifty-five percent of the Arizonans surveyed support the Yucca Mountain Project [right, south portal with boring machine. 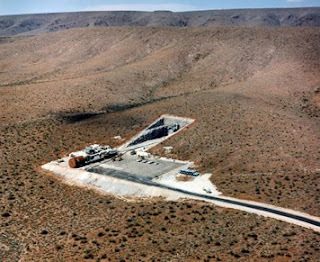 Credit US DOE] to store radioactive waste from nuclear power plants in Nevada. This compares to 58% of Nevadans who oppose the plan, according to a new poll in the Las Vegas Review Journal published this morning. The poll shows only 20% of Arizonans opposed the plan but 51% of Utahns surveyed were opposed. A "temporary" nuclear waste repository proposed on the Skull Valley Indian reservation west of Salt Lake City is opposed by the the governor of Utah and others, and has raised the public debate of the issue across that state. The LVRJ poll also found that "58% percent of those polled in Nevada, Arizona, Colorado, New Mexico, Utah and Wyoming supported increased uranium mining to expand nuclear power." The Mars Lander dug a sample from about 7 inches deep, the deepest yet, in the "Stone Soup" trench [right, credit NASA/JPL-CalTech, UA, Texas A&M] between two polygonal blocks, in hopes of finding something new. The thinking is that a variety of materials may have collected in the gap between the polygons. The sample will go into the Lander wet chemistry lab. August 26 marks the end of the main 90-day mission for the Lander, but NASA previously extended it for another 30 days based on its successes so far. Floyd Roehrich, Jr. will assume the post of state engineer at the AZ Dept. of Transportation, handling highway development, maintenance and environmental stewardship efforts. He replaces Sam Elters, who recently left ADOT for a position in California. As state engineer, Roehrich will direct work in ADOT’s nine construction districts. He will oversee the Intermodal Transportation Division, responsible for the construction and maintenance of more than 6,700 miles of highways and 4,000 bridges across the state. ADOT’s Office of Environmental Services is included in this division, which incorporates environmental stewardship with highway planning, operation and maintenance. In most other Western states, the State Engineer title goes to the person responsible for state water rights. 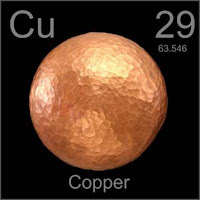 The Wall Street Journal predicts that China's demand for a quarter of the world's copper will resume as industrial plants resume production after being shut down to reduce pollution at the Olympic games. However, I hear others propose that many of those plants are unlikely to reopen because they were the most inefficient and polluting ones in the system. China's copper consumption is one the leading factors in the higher prices seen for the commodity in the past couple years. It slowed in the first half of 2008, although it was not clear at the time if this was due to general economic slowdown or restrictions for the Olympics. 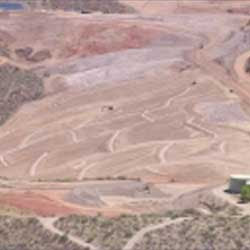 Arizona supplies about 60% of the U.S. demand for copper with prices set in the global market. 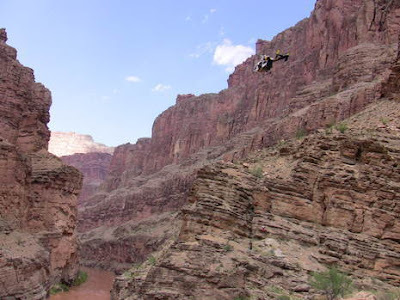 AZGS geologist Brian Gootee put into the Colorado River last Sunday, just hours after a flash flood swept through the Supai village area downstream from them. Brian's just back after 7 days on the river and shared this first photo from the trip. Brian drew in the flood stage mark, about 9 feet above Havasu Creek [right]. Brian was part of a re-photography expedition, which captured 80% of photos taken 40 years ago, to monitor changes in the canyon. He will be leading a Grand Canyon Field Institute hike through the area in October and will collect more data on the results of the August 17 flood. The Museum of Northern Arizona in Flagstaff received word on August 8 from the American Association of Museums (AAM) that its accreditation by the AAM had been restored. MNA’s accreditation was withdrawn by AAM’s Accreditation Commission on Dece mber 3, 2003, in response to the sale of 21 pieces from its collections by MNA’s former administration and board of trustees. The funds were used to finance an operating deficit, violating the Museum’s own collection policies. Under new leadership and wanting to regain accreditation as soon as possible, MNA sent its accreditation application to the AAM in December 2004. MNA received interim accreditation on March 26, 2007. On August 8, 2008 MNA officially received word from AAM that it had been granted full accreditation by the commission. AAM accreditation is the highest national recognition for a museum, signifying excellence to the museum community, to governments, funders, outside agencies, and to the museum-going public. MNA holds over 600,000 artifacts in its permanent collections of anthropology, geology and paleontology, biology, and fine art from Native and non-Native artists dating from the 1860s. It also houses extensive federal and tribal research collections, and a significant library and photo archive collection. 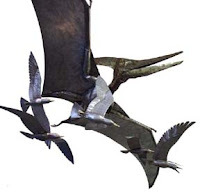 Look for the metal sculptures of Cretaceous Pteranodon and Ichthyornis [right above] soaring over Hwy 180 out front of MNA as you head north out of Flagstaff. The museum’s acclaimed exhibit of the Therizinosaur [right bottom] continues through March 2009. The samples are going through a 3-stage heating process. The low temperature heating is to look for ice in the sample. The next step is a middle temperature process to thoroughly dry the sample. The last heating takes the sample to 1000 degrees Celsius (1832 degrees Fahrenheit) to drive off gases that can help determine soil properties. I ran across another video about the flooding around Havasu Falls in the Grand Canyon last week. The focus is on the rescue of a Boy Scout troop but there are segments of the river in flood and the surging falls. It also gives a good sense of the danger that faced campers in the canyon. The National Science Foundation (NSF) Directorate for Geosciences has appointed Robert Detrick [right] of the Woods Hole Oceanographic Institution (WHOI) as its new director of the Division of Earth Sciences. Bob and I worked together at Standard Oil of California (now Chevron) in San Francisco in the mid-1970s. I'm delighted to see him move into this position that plays such an important role in guiding and supporting new directions in the earth sciences. Bob is currently a senior scientist and vice president for Marine Facilities and Operations at WHOI, and will begin his NSF position on Nov. 3, 2008. He is a geophysicist and seismologist whose research has focused primarily on the structure and evolution of oceanic crust, the size, depth and physical properties of ridge crest magma chambers, and the effect of hotspots on the thermal evolution of the lithosphere. NSF's Division of Earth Sciences supports basic research and education into the structure, composition, and evolution of the Earth, and the life it supports. 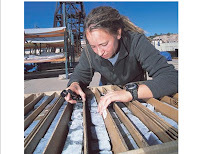 The Division has programs in geobiology and low-temperature geochemistry, geomorphology, sedimentary geology and paleobiology, hydrology, geophysics, tectonics, and petrology and geochemistry. Total retail taxable sales in Arizona for January through July were $30.7 billion, a 7% decrease from the same period a year earlier. The brightest area was mining and agriculture, with a 13.7% increase. The only other sector with an increase was miscellaneous retail, which includes bookstores, office specialty, and pharmacies. Vehicle sales were off 23% and home furnishings and furniture fell nearly 10% reflecting the drop in home buying. The mine complex is owned by BHP Billiton which started the reclamation project in 2003. The tailings impoundments cover 3,000 acres (1220 ha) and consist of seven different impoundments that are over 6 miles in length, 200 ft. high in places and just up gradient of the San Pedro River, according to the Arizona Mining Association. AMA reports that the closure plan calls for these facilities to be contoured, covered with soil, armored and revegetated to minimize long-term erosion and provide for lower long-term maintenance costs. There is a land rush across the West for solar energy projects, pushing land prices to over $20,000 per acre in Gila Bend by one report. Putting large solar arrays on tailings impoundments sounds like a winning strategy. The Arizona Geological Survey released new earth fissure maps today for Scottsdale, Mesa, and Toltec Buttes. 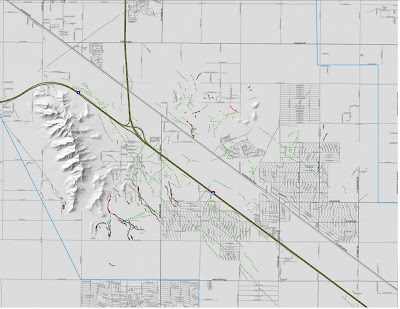 (right, excerpt of Toltec Buttes map, centered around the I10 - I8 interchange, between Phoenix and Tucson). Interactive versions of the maps are hosted by the Arizona Dept. of Real Estate. PDF versions are available at the AZGS Earth Fissure Center. A total of five maps have now been published. 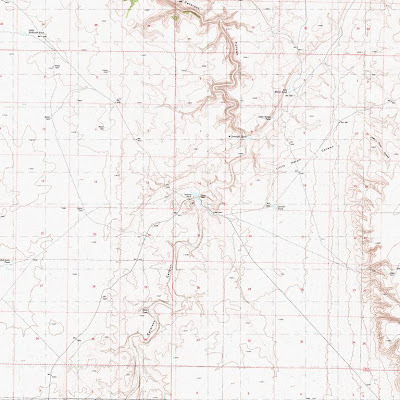 The two previous maps were updated today, with new fissures added to the Chandler Heights area and the boundary of the study area modified for the Apache Junction map. The new Chandler Heights fissures opened up following monsoonal rains in July. Additional earth fissure study areas are being mapped now and will be released as each map is completed and checked. You can compare this air photo of the Redlands Ranch area with the YouTube video I posted yesterday to see where the dam was breached last Sunday following heavy rains in the Grand Canyon area. Authorities now say the water from behind the dam was only a minor contributor to the canyon flows. The UA's Phoenix Lander opened new trenches at its Martian landing site looking for new materials to analyze and examining the soil and ice subsurface structure. The team described "the surface of the ground throughout the arctic plain where Phoenix landed is patterned in polygon shapes like those of permafrost areas on Earth, where the ground goes through cycles of swelling and shrinking. Some of the recent and planned digging by Phoenix takes advantage of landing within arm's reach both of the centers of polygons and the troughs between polygons. 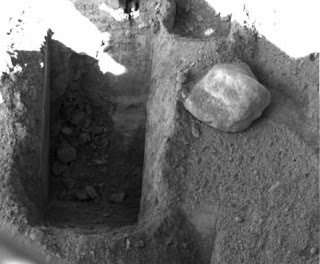 For example, the "Stone Soup" trench has been dug in a trough in the "Cupboard" excavation area, near the western end of the arm's workspace. The team plans to dig in this zone as deep as possible to study properties of the soil and ice deep in a polygon trough." 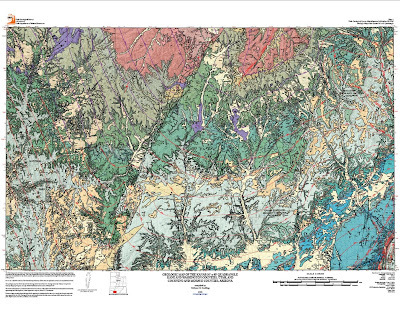 The Utah Geological Survey has released a new geologic map of the Kane 30x60 quad, covering 1,900 square miles of parts of Kane and Washington counties in Utah and Coconino and Mohave counties in Arizona. The map includes Zion and Bryce Canyon national parks and about one-third of Grand Staircase-Escalante National Monument. It represents the most recent compilation of the geology for this area and uses new mapping in many places. It is available for $24.95 at the Natural Resources Map and Bookstore at 1594 W. North Temple, Salt Lake City, or from geostore@utah.gov. The online version is 38 Mb, so it takes a while to download. UA Geosciences student Alexander Rohrmann, is the recipient of the first Farouk El-Baz Student Research Award from the Geological Society of America, to encourage and promote desert research. GSA will present him with an award check, a certificate, and a ribbon at the GSA Annual Meeting in Houston on October 6. Raw aerial video shows the Redlands dam breach and the flood at the Falls. The national League of Women Voters has called for a 10-year moratorium on new coal-fired power plants. There is one coal-fired power plant under construction in Arizona, the 400 MW Springerville Generating Station Unit 4 [above]. There are 17 plants under construction across the country with another 66 in the permitting process. 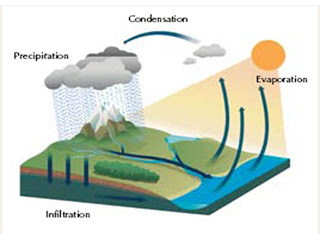 Much of the geothermal potential of Arizona is thought to be in this kind of system, rather than the hot springs systems that are more typical of Nevada, Utah, and California. The company's philanthropic arm, Google.org, will invest $6.25 million in AltaRock Energy Inc. and $4 million in Potter Drilling Inc., to support development of technologies to reduce the cost of geothermal power. Google.org will get 1% of Google stock and 1% of its annual profits to fund its activities. The company also will give $500,000 to the geothermal lab at Southern Methodist University in Dallas. The Vatican Observatory's related facility, the Vatican Observatory Research Group, is set up in the Steward Observatory [right] at the University of Arizona. Here, the Vatican is conducting detailed research on dark matter, quasars, and the universe’s expansion, according to an article in Discover magazine titled, "How to teach science to the Pope." The Vatican Observatory Research Group operates the 1.8m Alice P. Lennon Telescope [above] with its Thomas J. Bannan Astrophysics Facility, known together as the Vatican Advanced Technology Telescope (VATT), at the Mount Graham International Observatory (MGIO) in southeastern Arizona. The article also describes the Pontifical Academy of Sciences, "an independent and remarkably influential body within the Holy See. Over the years its membership roster has read like a who’s who of 20th-century scientists and it currently boasts more than 80 international academicians, many of them Nobel laureates and not all of them Catholic—including the playfully irreligious physicist Stephen Hawking. There are no religious, racial, or gender criteria. Candidates are chosen on the basis of their scientific achievements and their high moral standards. 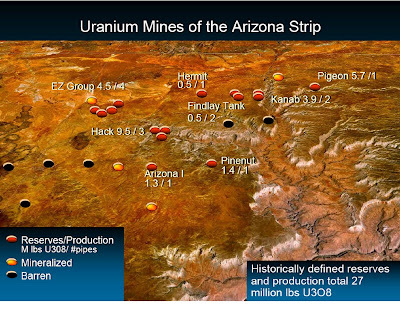 The U.S. Bureau of Land Management is processing uranium exploration claims on lands north of the Grand Canyon, despite a court injunction that has temporarily halted uranium development on national forest lands on the south rim, according to a story, "Do uranium mines belong near Grand Canyon?" in the Christian Science Monitor. One claim was approved for drilling two days after the U.S. House’s Natural Resources Committee voted emergency action to stop exploration. But a Department of Interior spokesman says the BLM is still processing claims because the agency doesn’t consider the Congressional vote valid. 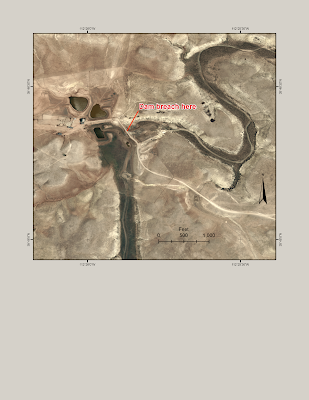 Thanks to "anonymous" who posted a comment to my earlier blog with a link to TopoQuest.com for the location of the Redlands dam [right] in the Little Harpo Canyon quadrangle, upstream (south) of Cataract Canyon. 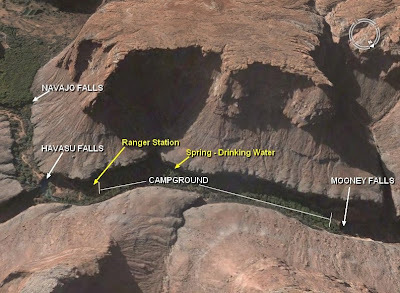 The dam was erroneously identified by local authorities as the cause of the flooding that hit the village of Supai in the Grand Canyon, early Sunday morning but corrected the next day. 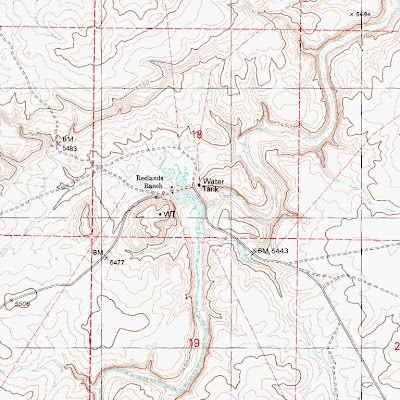 The Redlands Ranch area is in the center of the lower map, showing its location relative to Cataract Canyon, the prominent drainage in the upper center of the map. This event's attracting a lot of attention. My posts have had four times as many hits as anything else I've ever put online. The expansion is designed to increase production to an average of 56.4 million lbs copper, 10.3 millions lbs of molybdenum and 600,000 ounces of silver per year for the first 10 years of production. Stage II of the expansion, increasing to 50,000 tons per day of ore through the mill is expected to come on stream during mid 2009.
designed to increase production to an average of 56.4 million lbs copper, 10.3 millions lbs of molybdenum and 600,000 ounces of silver per year for the first 10 years of production. Stage I is currently under construction and, when completed in the second half of 2008 will have a production capacity of 25,000 tons of ore per day through the mill. 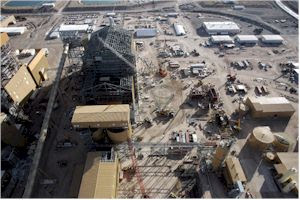 Stage II of the expansion, increasing to 50,000 tons per day of ore through the mill is expected to come on stream approximately nine months later, during mid 2009. The National Park Service says that the earthen dam breached early Sunday morning on a private ranch near Grand Canyon National Park did not contribute to the massive floodwater sweeping through the canyon. By 3 am on Sunday, a number of bridges and three homes on Havasu Creek were washed away by rising waters. The Coconino County Sheriffs Dept said the Redlands Dam, which was initially blamed for the flooding, is a small dam that forms a pond to provide water for livestock. The sheriff's office spokesman said it isn't a "huge, significant" structure and its rupture was only one factor in the flooding.